As much as I advocate for free market capitalism — you know, the ability to enter into whatever transactions you want, so long you’re not… say… hiring a hitman to take out that annoying man known as your mistress’s husband — even I have to admit that it’s tempting to call for restrictions on the things that annoy you. Like a letter I received in the mail this evening. Some context first. On June 5, 2015, I was involved in an automobile collision. I’m typically not all that great keeping an up to date insurance card in my car for ready demand by an officer. I haven’t been pulled over for any kind of moving violation since 2010, and the last time I was pulled over at all, I wrote an article about it — and I had a proper insurance card at that time. But when you’re involved in a collision, the police tend to take interest, mainly because someone points it out to them. According to police records you may have received a violation. If it is a moving violation we may be able to get it reduced to a non-moving no points violation. I am an experienced criminal defense attorney. I am confident that I can help defend your rights. Please call 816-221-2400 for more information. Payment plans may be available. All major credit cards accepted. Disregard this solicitation if you have already engaged a lawyer in connection with the legal matter referred to in this solicitation. You may wish to consult your lawyer or another lawyer instead of me (us). The exact nature of your legal situation will depend on many facts not known to me (us) at this time. You should understand that the advice and information in this solicitation is general and that your own situation may vary. This statement is required by rule of the Supreme Court of Missouri. Yeah. 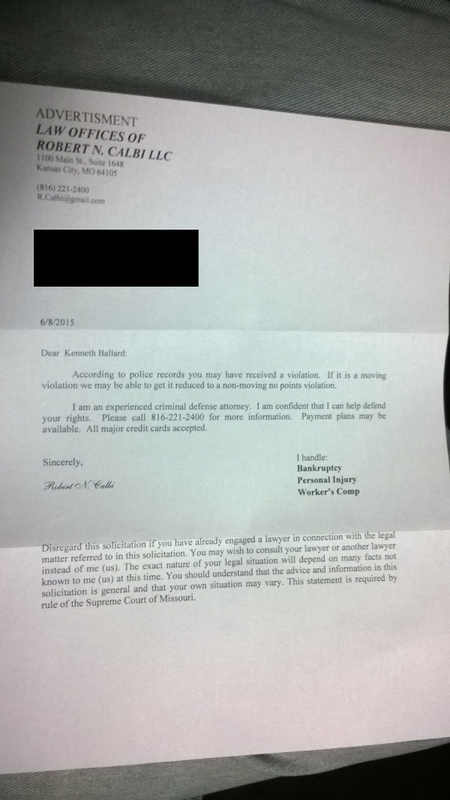 I got solicited by a lawyer. What’s worse is the listed specialties. None of them cover traffic violations: bankruptcy, personal injury, and worker’s comp. Now in Kansas City, if you don’t have proper proof of insurance, you are likely to get a citation for not actually being insured — the officer has no way of knowing if the insurance card is merely out of date, and they can’t rely on your word. For Kansas City, that’s listed as a violation of ordinance 70-270(A). Pleading it is quite easy: bring proof you had insurance on the date of the offense and just plead “not guilty” when asked about the citation. Here’s the kicker: depending on jurisdiction, this may not get you entirely off the hook. Last time I had to plead on a “not properly insured” charge — remember how I said I’m terrible about keeping an up to date insurance card with me — the charge got knocked down to a lesser offense of not having proper proof of insurance, which carried a $25 fine. The difference between the last time and this time? The previous ticket was issued for Gladstone, Missouri, not Kansas City, Missouri. For Kansas City, having evidence you were properly insured on the date in question is an absolute defense, nullifying the charge. So either way that’s my annoyance for the evening. I know that the law firm has no way of knowing if I was actually properly insured based on the citation. But rather than sending out a form letter, how about determining if the violation is actually a moving violation — which not being properly insured is a moving violation — instead of writing “If it is a moving violation” in the solicitation. That and it also helps when you’re soliciting to assist with a moving violation to actually say that you handle moving violations. After all you don’t call a bankruptcy attorney to talk about a speeding ticket. But what would I restrict with regard to this letter, if I was up to the task? People can use public records as sources for new leads. After registering a fictitious name with the Missouri Secretary of State back in 2009, I started receiving various solicitations in the mail addressed to that fictitious name. So yeah, if there was something I could restrict, I’d look into that, finding a way to disallow businesses from using public records for the purposes of soliciting business. But such a measure wouldn’t survive the Courts — a similar measure that was on the books in Rhode Island was struck down in Federal Court.